VistaGlance 1.1 is launchers & task managers software developed by QwertyStudios. Instantly find document, music, video or run program you want within several seconds since you firstly think of it. You don't need Explorer now! Super fast indexing, super fast search by file names, attributes, and tags.. Copy, move and open parent folder of found files, apply smart filtering and sorting. Works with CD\DVD\USB-drives. Let computer guess what you need. Uses artificial intelligence with fuzzy logic to show you the files you want. This launchers & task managers software is freeware, which means you can download and use VistaGlance 1.1 absolutely free. There's no need to buy the product. 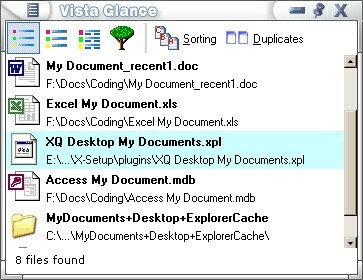 VistaGlance 1.1 supports English interface languages and works with Windows 98/XP/Vista. Latest VistaGlance 1.1 does not contain any spyware and/or advertise modules, allowing installing it with no worries concerning valuable information loss. We has completely tested launchers & task managers software VistaGlance 1.1 many times, written and published the interesting article and uploaded installation file (2429K) to our fast server. Downloading VistaGlance 1.1 will take minute if you use fast ADSL connection. Smart Folders creates a special kind of folder that will search your entire hard drive and find all items that match certain criteria that you specify. Super Task Log allows you to manage all of your tasks, define parent projects and save out XML data. Alorsoft Media Indexer allows you to browse indexes of your removable media as if they were inserted in your computer.